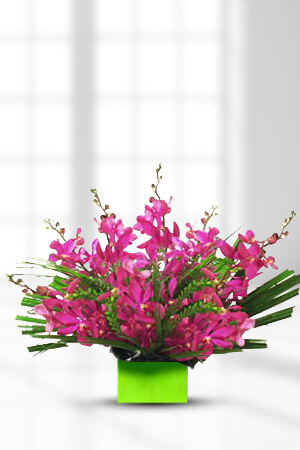 For you, our discerning customer, we have hardy and long-lasting, yet exquisitely delicate Orchids in a boxed arrangement with Spear Grass and Palm Leaf. They will stun you with their burst of colour and intrigue you with their intricate blooms. Satisfy your curiosity and order this arrangement today.To personalise your gift, you can order a bottle of wine to be sent with your order. For Curious, we recommend a bottle of Sparkling Wine to leave a lasting impression. To expansive, becouse you are speeking about discount on the beginning. !! It is not good bussines practis. Easy to order and the flowers arrived on the chosen day and look great! After initial concerns over this order, I can say the outcome was great. Very good, my Aunt loves them. It was a quick, easy process. Loved the wide variety available. My friend was thrilled with them.